H. Arnold Steinberg, businessman, philanthropist, tireless volunteer and Chancellor Emeritus, died suddenly on Friday, Dec. 11, at the age of 82. 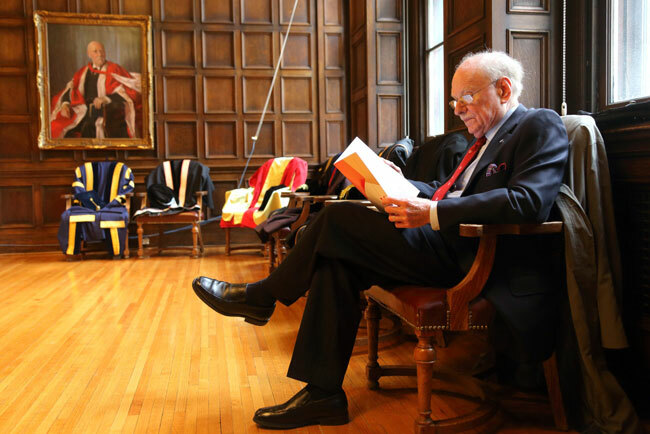 With his passing, McGill, the McGill University Health Centre and the Montreal community lost one of their greatest servants, and a man who was happiest when he was giving back. H. Arnold Steinberg, businessman, philanthropist, tireless volunteer and Chancellor Emeritus, died suddenly on Friday, Dec. 11, at the age of 82. With his passing, McGill, the McGill University Health Centre (MUHC) and the Montreal community lost one of their greatest servants, and a man who was happiest when he was giving back. Never was Steinberg’s decisiveness more clearly on display than when he spearheaded the movement to have Vitamin D added to Quebec’s milk in the 1960s. As a board member of the Montreal Children’s Hospital Research Institute at the time, Steinberg was concerned when he learned that rickets, a condition that weakens children’s bones, had reached near epidemic proportions in Quebec. It was especially galling because, by then, it was understood that milk enriched with Vitamin D would all but eliminate the problem. Unfortunately, there was a major supplier who simply refused to add the supplement. As Chief Financial Officer of the Steinberg’s grocery store chain popular throughout the province at the time, Steinberg issued an ultimatum to the stubborn supplier – start adding Vitamin D to the milk or lose a lucrative contract. In a very short time, rickets was all but eliminated in Quebec. That newfound confidence stood Steinberg in good stead. Over the course of his successful career, he served as both a member of the Board of Directors and its Executive Committee of Steinberg Inc., and held a number of senior management positions including Executive Vice-President, Chief Financial Officer, Chief Administrative Officer and Chairman of Ivanhoé Inc. He also served on the boards of various public companies, including Bell Canada International, Teleglobe Inc., Provigo Inc. and Banque nationale du Canada. Despite his many successes, Steinberg was humble and possessed a self-deprecating sense of humour. “My very first class happened to be at Moyse Hall. On one side of the face of the wall as you go it are the names of all the Principals and Vice-Chancellors. On the other side are the names of all the Chancellors,” he told the Reporter in 2009. “I remember looking at the impressive names on that list: Lord Strathcona, Sir Edward Beatty, Ray Edwin Powell – I just felt so honoured to be attending a university where all these prestigious people had served. I never, never thought that one day my name would be included there. “I was just happy to get through that first year,” he said with a chuckle. 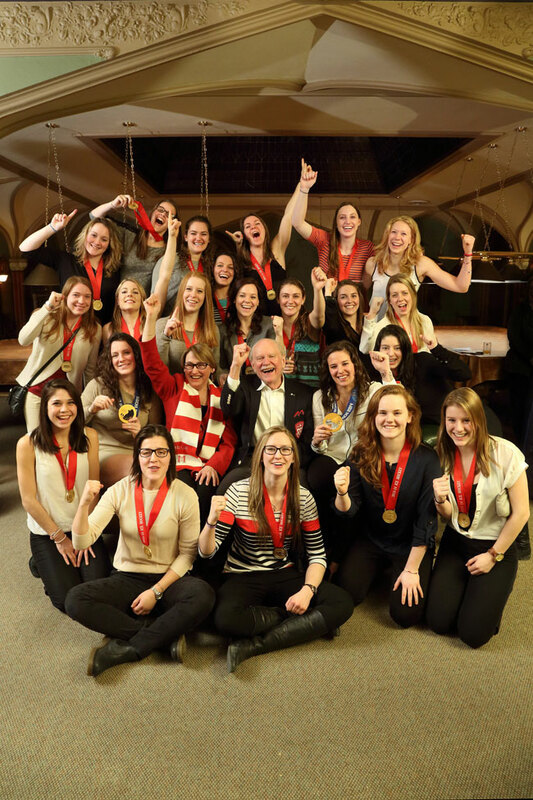 Steinberg was a tireless fundraiser and volunteer who, among other duties, spent 10 years on the University’s Board of Governors and 19 years as Chairman of the Board of Governors of the McGill University-Montreal Children’s Hospital Research Institute. He also served as a co-chair of the Capital Campaign for the Montreal Children’s Hospital and was the founding president of the National Food Distribution Centre for the Treatment of Metabolic Diseases. 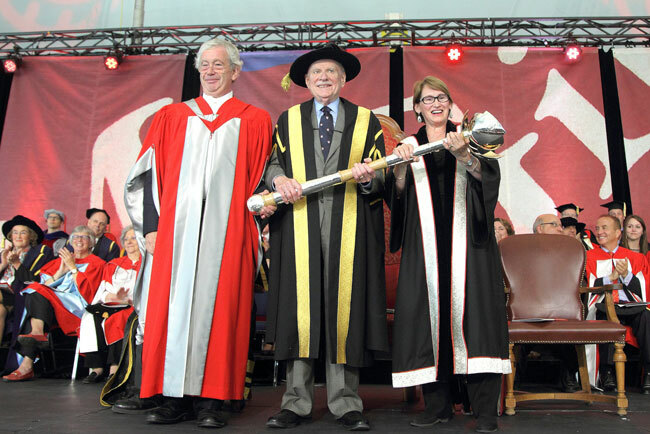 He was the Founding Chairman of the MUHC Board, member of the MUHC Research Institute, and had served as Chairman of the Advisory Board of the Faculty of Medicine of McGill. In 2005, Steinberg was appointed by Order-in-Council to the Governing Council of the Canadian Institutes of Health Research where he served as Vice-Chair. In 2006, he deepened his commitment to patient care with the creation of the Arnold and Blema Steinberg Medical Simulation Centre, recently renamed the Steinberg Centre for Simulation and Interactive Learning. 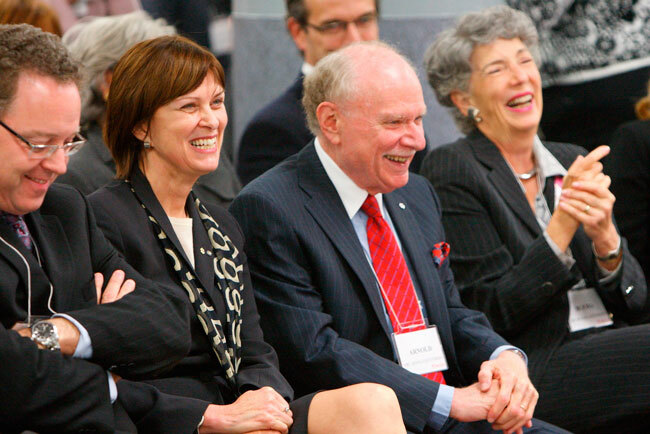 This past October, Steinberg and his wife, Blema, donated $7.5 million to the Centre to expand its facilities, enhance its technologies and broaden its scope of activities. “I consider it a privilege to be able to help the Centre take this exciting new step in its evolution, and to realize a vision that will have far-reaching benefits for health care professionals, patients and communities in Canada and around the world,” Steinberg said at the time. But Steinberg admitted that he got as much out of his various duties and volunteer roles as the people he served. Never was this more apparent than during his time as Chancellor. As his five-year mandate was coming to a close in 2014, Steinberg told the Montreal Gazette that he couldn’t believe his good fortune at being chosen for the office. “It is such a rare honour that I still kind of pinch myself that I was given that opportunity,” he said. Current Board Chair Stuart “Kip” Cobbett said he had tremendous respect for Steinberg. H. Arnold Steinberg is survived by his wife, Dr. Blema Steinberg, Professor Emeritus at McGill, and children Margot, Donna and Adam. Each of his children, along with grandson Joshua, delivered moving , eloquent eulogies at Steinberg’s jam-packed funeral service on Monday. They spoke of his relentless curiosity, extraordinary generosity and zest for living life to its fullest. Learn more about the tribute project honouring H. Arnold Steinberg. A great human being: he will be sorely missed by many. Arnold Steinberg was one of the best friends and colleagues I ever had at McGill and the MUHC over a combined period of 40 years. We worked together first for the Montreal Children’s ,then on McGill,s Board Executive committee, in the creation of the MUHC and on it’s first Board and finally on the Foundation. Extremely clever, generous,loyal to his friends and the institutions he led, thoughtful in weighing the decisions that had to be made and always a joy to be with. Along with his many many friends and colleagues I will miss him and also miss the invaluable advice he gave me whenever asked.